Indo-Russian high-tech collaboration has entered the nano phase with a deal between Rusnano and SUN group. The sky is the limit! “In all the areas we discussed, we met potential partners with experience working in vigorously developing business,” said an excited Chubais. Chubais, one of the heavyweights of the Russian market reforms of the 1990s, was appointed to head Rusnano a year after it was set up in 2007. Chubais signed a collaboration agreement with SUN Group, a private, Indian family-owned investment group active in Russia. The two companies will study the most promising sectors for business development in nano-technology. They will also be looking at expanding Indo-Russian collaboration in global technological chains. SUN Group will help Rusnano’s engineering companies find Indian partners to set up joint ventures. Rusnano sees India as a rapidly growing region with an attractive domestic market. “We are interested in its size and drive to develop industries and technologies. There is successful work being carried out in India in technology and innovation, and we are interested in a number of them,” Chubais stressed. The most interesting areas for collaboration are solar energy, nano-materials and biotech. Rusnano has much to offer the Indian side. “For example, take a joint business model for an Indian company in optoelectronics technology. We can offer such a company the possibility of relocating its business to Russia while being based on Indian designs. We can find an engineering partner who will be able to develop it. We will also be able to develop the scientific and technical support needed.” He cited incentives like tax breaks and easier land permits for manufacturing to attract Indian firms to set up shop in Russia. “We can also provide access to capital and consider very long-term financing deals, such as for a period of ten years,” said he. 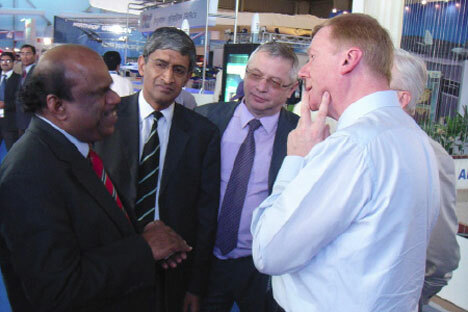 Rusnano has also offered its expertise in nurturing a market for innovative products. In the three years since it was founded, Rusnano has considered over 2000 projects. It is also financing the development of detectors for explosives and drugs. A quarter of the projects in Rusnano’s portfolio were initiated by foreign partners. Russia is already working actively in nano-technology with the US, Israel, Finland, South Korea and Taiwan. Chubais has no doubt that India will be added to its list of partners. “Give us five or six months and by that time we will have made some concrete decisions and signed contracts”. Rusnano is looking to create a viable nano-industry in Russia capable of achieving $30 billion worth of production on the open market by 2015. Around $870 million has been earmarked for a range of nano-technology projects in Russia. Russia is now fourth in the world (about $570 million) in investments in this sector, after the US ($3.3 billion), Japan ($2.6 billion and Germany ($800 million). Rusnano’s main areas of interest are solar energy, nanostructured metals, medicine and biotechnologies, machine building and metal processing, optoelectronics and nanoelectronics. With India setting an ambitious target of 20,000 MW of solar power generation capacity by 2022, the Indian government and Rusnano are considering a $220 million joint venture to manufacture solar PV module-grade silicon ingots. This could involve building a manufacturing facility in Russia where ingots will be produced and then exported to India. India is looking at sourcing 2000 tonnes of silicon ingots from this venture. India has a slew of solar PV module manufacturers like Moser Baer, Tata BP Solar and IndoSolar, but there are almost no producers of silicon ingots. Officials of India’s department of science and technology are keen to include a strong research component into the joint venture which would enable Indian scientists to participate in further development of solar photo-voltaic cells. "There is a huge demand for silicon wafers as efforts are on to meet the 22 GW solar power target under the National Solar Mission," an official said.